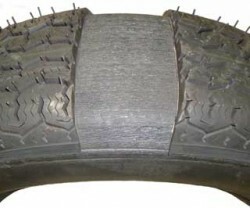 The tyre casing comprises the entire main structural body of a tyre, often called the carcass. Tyre casings include the materials under the tread, the sidewall, and steel belts. The tyre casing is the inner structure of the tyre reinforced in the manufacturing process, with the layers of rubber coated plies made of polyester, nylon, rayon, or steel, that comprise the resistant structure of the tyre upon which the tread, belts, bead, and sidewall are laid. The picture bellow shows a cross section of a tyre, showing the casings underneath the tread.